Due to increasing demands, St. Alexius is moving and expanding the healthcare organization’s Mandan operations. 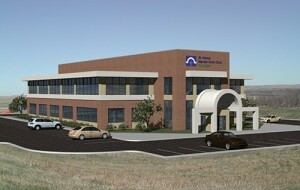 The new 22,000 square foot healthcare facility is expected to open in 2014 and cost around $8 million to complete. The clinic will offer of imaging, laboratory and select rehabilitation therapy services as well as a retail pharmacy and space to expand in the future. Sen. John Hoeven, R-ND, joined by Sen. Lisa Murkowski, R-AK and North Dakota Mineral Resources Director Lynn Helms, recently announced legislation that would put states in charge of regulating hydraulic fracturing in North Dakota’s energy industry. The legislation has been named the Empower States Act and is being co-sponsored by Murkowski. The Act allows states to manage fracking and gives state agencies first response to any regulatory violations. Additionally, states and tribes would be allowed to challenge regulations in court and federal agencies must show a need for new regulations if the state already has an alternative in place. Baker Hughes, a drilling technology company, has opened a 138,000 square-foot facility on 35-acres of land in Williston. The operations base follows a recently opened base in Dickinson and another facility is expected be built in Minot. The facility cost over $30 million in infrastructure and will allow the company to increase its coverage area in providing completion tools and drill-bits to the Bakken area.